Crafting Tech | It's all about the process. It's all about the process. Crafting Tech is a collaboration between Computational Craft and Artisanal Tech, two courses taught at Parsons The New School for Design in New York City and Parsons Paris respectively. Through this collaboration, our goal is to promote a central learning outcome of the course: the importance of process and documentation practices. We will create a ongoing digital and physical platform for students to reference techniques and materials; to communicate and exchange with each other; and to share work with broader communities in and outside of Parsons through a series of workshops and exhibitions. The field of electronic crafts or eCraft lives at the intersection of art, design, electronics, engineering, fabrication, and anthropology. By combining these disciplines, we access the techniques, tools, and practices each affords. Its vibrancy, however, is dependent on a commitment of practitioners to share the mash-up processes they have discovered with others. Historically, craft has been a means of documenting and relaying information. Makers capture stories and information in the product and forge relationships in the process of making. Tacit knowledge of a technique is passed from master to apprentice, from grandmother to grandchild, from one knitting circle member to another. The rise of DIY and maker culture has created a parallel and often intersecting subset of communities built on similar values of sharing and openness. It is this process of making and sharing that empowers individuals and nurtures communities. We craft technology to understand the world around us. By understanding how to control the flow of electricity in a simple fabric circuit, we can apply this information to the devices we interact with everyday. We are able to lift the black box and critique our tech in new ways. We share with each other to learn new methods and exchange ideas. We combine practices from disciplines to form new processes and approaches to our design. During the semester, classes will be linked through a main blog at craftingtech.com (individual classes will maintain their own sites). This will house tutorials, resources, materials library, projects from the field, conferences and events, etc. that students will use as a reference tool. Since the classes will focus on different techniques, this space will allow the classes to complement each other. 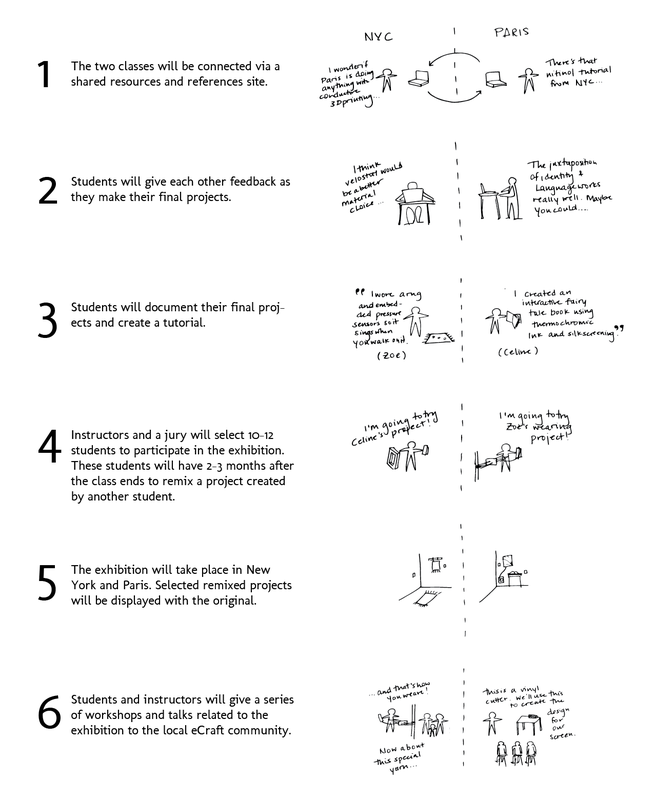 Students will prepare final projects that deal with themes discussed in class and materials used during the course. As they construct their projects, students will document the process extensively, culminating in a tutorial on the class blog or other external platform. Students will also be required to give feedback to their trans-Atlantic colleagues at various points. Upon completion of the course, students will have two opportunities to participate in the Hybrid Process project: (1) the exhibition and/or (2) the workshops and talks. We will ask students to make each other’s projects to submit to the exhibition. They have the option to duplicate a design or remixing it for their own needs and circumstances. Between seven and ten projects will be chosen for the show with the course faculty and jury selecting projects to be included. Both iterations of the project will be displayed – the original and the remixed. It will highlight the process of making, sharing, remaking, and sharing again as well as the communities that form as a result. We will have a series of workshops and talks to extend the reach of the exhibition beyond the gallery walls. Students and the local community will be able to learn more about the techniques, materials, and cultural context of electronic craft. Workshops will be organized and run by Computational Craft or Artisanal Tech students and instructors. Talks and panels will bring master practitioners within both cities to discuss relevant issues and themes within the field. For us, this project is as much about connecting eCraft practitioners, learners, and any other interested parties internationally as connecting our students. We hope to create future opportunities for our students and new collaborations within the community.